This discussion focuses on the issue of participation in relation to fieldwork in China. Drawing upon more than 24 months of musical ethnographic fieldwork in rural Kam (in Chinese, Dong 侗) minority areas of southwestern China since 2004, I describe the main participatory aspects of my research methodology. I look at three of the main challenges—linguistic barriers, cultural concerns and research positionality—that I faced while utilizing participation as part of my research, and describe some of the most effective ways in which I was able to turn these possible “constraints” into productive ends, writes Catherine Ingram. 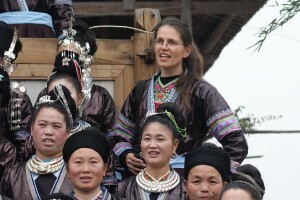 During the past nine years I have undertaken more than 24 months of ethnographic research in rural Kam (in Chinese, Dong 侗) minority areas of southwestern China to investigate Kam music. Through being invited to participate in daily activities and musical events in rural Kam communities, and through my involvement in the lives of Kam friends and teachers, I have learnt to speak the Kam language and sing many Kam songs (singing is the main musical activity in Kam communities). The range of activities I have participated in together with Kam friends has extended from preparing food, collecting wild foods in the mountains, and planting and harvesting rice to learning Kam songs, watching and discussing VCD and DVD recordings of Kam singing performances, and singing various genres of Kam songs at weddings, at New Year celebrations and in many staged performances. A documentary (click here) about my research that was produced by Guizhou Television in 2011 (based on an earlier documentary made by the same director in 2006) gives an overview of some of the many different ways in which I participated in Kam community and musical life. Participation has allowed me experiences and understandings that have been extremely beneficial for my research, and has also been the key to developing relationships with Kam people and defining my position in Kam communities. It has helped to make my ongoing research a more collaborative undertaking, and has better ensured that some of my research activities have direct benefits for Kam communities. 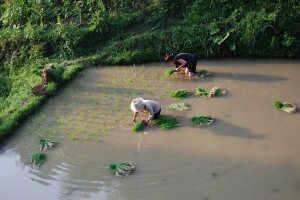 While my use of a participatory research methodology has also had advantages—and challenges—for the members of Kam communities where I have conducted research, here is not the forum for discussing either of those aspects (part of my decision to undertake research in this manner was made on the basis of projecting the likely benefits and challenges). Instead, following a brief background about Kam people and Kam music, I discuss three of the main challenges that I faced in utilising participation as part of my research—challenges related to linguistic barriers, cultural concerns, and research positionality. I also describe some of the most effective ways in which I was able to turn these possible “constraints” into productive ends. Kam people, with a population of more than 3 million, are one of China’s fifty-five officially recognised minority groups. Although most Kam people live in southeastern Guizhou province and the bordering areas of adjacent Guangxi and Hunan, the majority of Kam youth (and many middle-aged villagers) now spend significant periods—often years—working or studying outside their home villages. 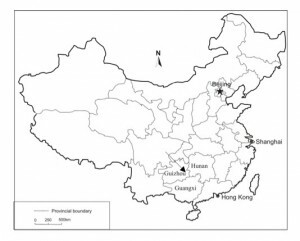 Most of my research was undertaken in Sheeam (in Chinese, Sanlong 三龙), a Kam region in Liping county, southeastern Guizhou, which is well known for its many singing traditions. Kam people in Sheeam and many other Kam areas speak a dialect of Kam as their first language. The Kam language is a tonal Tai-Kadai family language that does not have a widely used written form, and is quite different from the various dialects of Chinese. It is the main language used in singing the many different genres of Kam songs, including “big song” (sometimes also referred to as “grand song”), the Kam song genre that was inscribed on UNESCO’s Representative List of the Intangible Cultural Heritage of Humanity in 2009 (click here, here and here to visit the UNESCO website that feature big songs). One of the main challenges I faced throughout the research concerned linguistic barriers. I began my research with good fluency in Mandarin and some understanding of one Chinese dialect used in Hunan, but I had no experience with Kam or the local Chinese dialect spoken in Liping county. Consequently, I found it most useful to approach Mandarin speakers in Kam villages for help with learning Kam. In most cases, the best Mandarin speakers were secondary school students. With patience and a lot of time, with regular Kam song learning and discussion, and with daily involvement in many different activities where I was surrounded by people speaking Kam, I was gradually able to gain fluency in the language. My new Kam friends also quickly gained confidence in sharing jokes about the many hilarious things I said and did while learning to speak Kam, and these humorous aspects of my language learning were often a favourite topic of discussion. But the jokes were helpful for reinforcing my language learning and, especially, seemed to make it more enjoyable for Kam people to engage with a novice Kam speaker. I quickly learnt that my attempt to learn the language was also valued by many villagers as demonstrating respect for local culture. In fact, on many occasions when my language skills were less advanced, I found that people with little Chinese ability were willing to use their limited Chinese to communicate with me once I had first made an attempt to talk with them in Kam. Certain Kam social conventions differed from those I had encountered in other parts of China or elsewhere, and I had to be taught many aspects just as children were instructed and socialized within Kam society. I was extremely fortunate in always being able to rely on guidance and support from my three singing teachers in the village and from Nay Lyang-jyao, one of my closest Kam friends (and whose family I lived with in Jai Lao, the largest village in Sheeam). Nay Lyang-jyao would sometimes offer suggestions about how I should act (or should have acted) in a particular situation, and I could ask her questions about how I should deal with particular issues. Other members of Nay Lyang-jyao’s family also often offered advice and guidance, as I began to be seen as part of their family and thus my actions reflected upon them to some small degree. This advice ranged from instructions about particular statements I should make at certain social junctures to the gifts I should offer at weddings or the way I should modestly refuse at least the first few requests to sing a Kam song. This input was critical to the success of my participation in Kam society and to my development of some depth of understanding of Kam culture. It also helped others in the community accept my involvement in their lives far more easily. Many Kam friends were willing to go to great lengths to support and become involved in my research, to teach me about Kam culture, and to assist with checking or elaborating upon information about Kam people and music. This seems to suggest that Kam villagers saw my research approach as being appreciative of Kam culture and lifestyle, and that through the research process my friends felt understood and respected. This brief discussion of three of the main challenges I encountered in utilising participation in musical ethnographic research indicates that employing such a research methodology requires consideration of many complex and interwoven factors. However, I hesitate to suggest that these challenges are necessarily “constraints.” As I have shown, it is certainly possible to overcome these and other difficulties in participatory research. Moreover, the process or result of overcoming these factors often leads to insights or actions that can be instrumental in the success of the research project. For instance, the challenge of learning to speak Kam was a process that also built positive relationships; the challenge of learning from my friends about Kam cultural norms helped me to gain a great deal of knowledge about Kam culture and language; and the challenge of positioning myself within Kam communities led to me joining with my friends and teachers in many different kinds of daily village activities, enabling the kinds of invaluable insights into Kam music-making that could only arise through direct experience and through positive, equitable and long-lasting relationships. Catherine Ingram a Newton International Fellow in the Department of Music, School of Oriental and African Studies (SOAS), University of London, and an Honorary Fellow at the University of Melbourne, Australia. She was previously an Endeavour Australia Cheung Kong Research Fellow (Australia/China, 2010–2011) and a Postdoctoral Fellow at the International Institute of Asian Studies (The Netherlands, 2011). 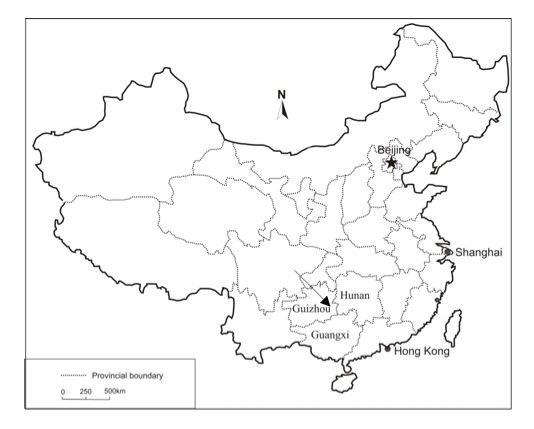 This entry was posted in Boundary Crossing, Local epistemology, Researcher's Positionality and tagged Boundary Crossing, China, cultural concerns, Guizhou, Kam minority areas, linguistic barriers, research positionality. Bookmark the permalink. About Kam people, James R. Chamberlain (2016) proposes that their ancestors originated in the state of Chu and only moved slightly southwards to their present-day area from their orignal homeland.